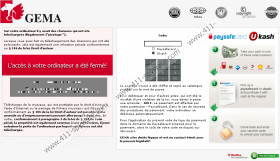 L’accès à votre ordinateur a été fermé Virus is a ransomware that can lock down your computer and trick you into thinking that you need to pay money in order to regain your administrative privileges. Is this true? Absolutely not, and the last thing you should do is waste your money on a bogus fine that is unlikely to restore your access to the computer. This is because cyber criminals do not care about your computer’s integrity and all that they need is your money. Hence, the sooner you remove L’accès à votre ordinateur a été fermé Virus the quicker you will be able to enjoy your PC’s services. Continue reading to find out infection’s origins, symptoms and removal tips. Unfortunately, the virus is only one of the many ransomware infections threatening the French Windows users, and other malicious programs (Auf ihrem computer ist infiziert Virus, Police on Web Virus, Votre Ordinateur Est Bloqué Virus, etc.) could be used by schemers to trick computer owners all over the world. All of these infections are often denominated with the Ukash virus name, because this system (alongside Paysafecard) is offered to make the demanded payments. Even though Ukash is a legitimate company that should not be linked to schemers, the lack of identification needed to use its services has helped schemers to utilize it for their malicious scams. Using arrow keys on your keyboard select Safe Mode with Networking. When the system loads up, go to http://www.411-spyware.com/download-sph and download SpyHunter, an automatic malware removal program. Those running Windows 7/Vista: install the application. Those running Windows XP: click on the Start (within Task Bar), launch RUN and enter “msconfig” to access System Configuration Utility. Then, click on the Startup tab, Disable All listed programs and click Apply. Restart the PC and install SpyHunter.